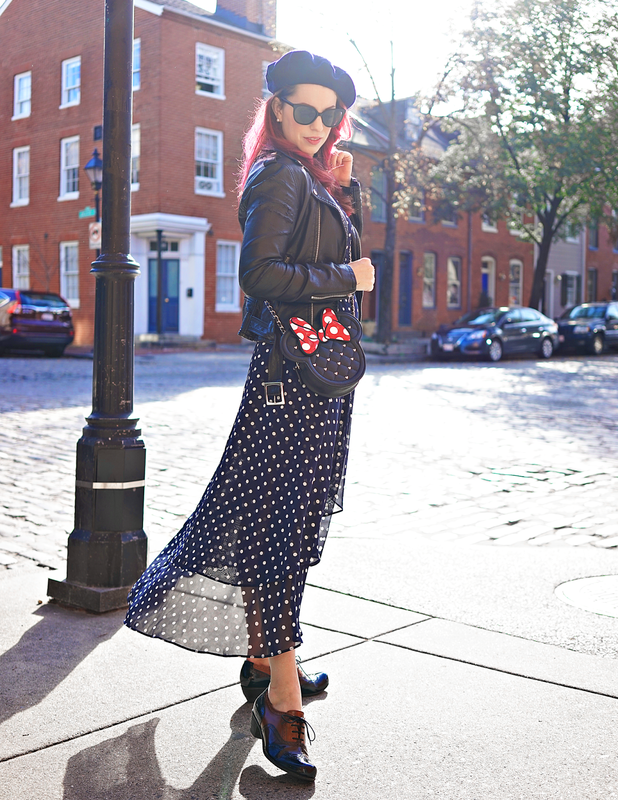 My love for polka dots is nothing surprising, but what is new is my Loungefly Minnie Mouse Cross Body Bag. 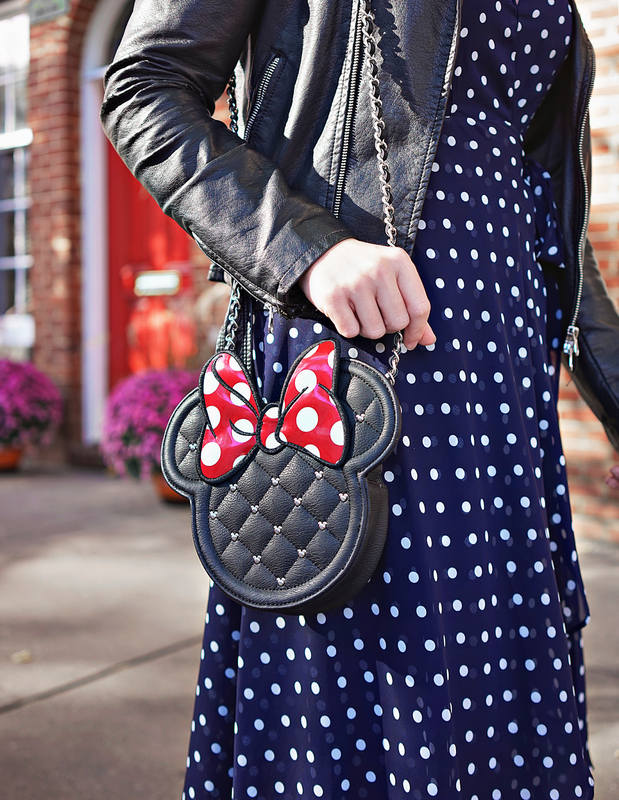 It pairs perfectly with any outfit to add a little Minnie Style. It's such a cute little bag! The bow is an iridescent red and the body of the bag is quilted - even the little silver studs are in the shape of Mickey! The classic colors match just about anything and it's large enough to fit all your necessities - phone, lip gloss, etc.It's just a great way to add a little Disney magic to your every day. 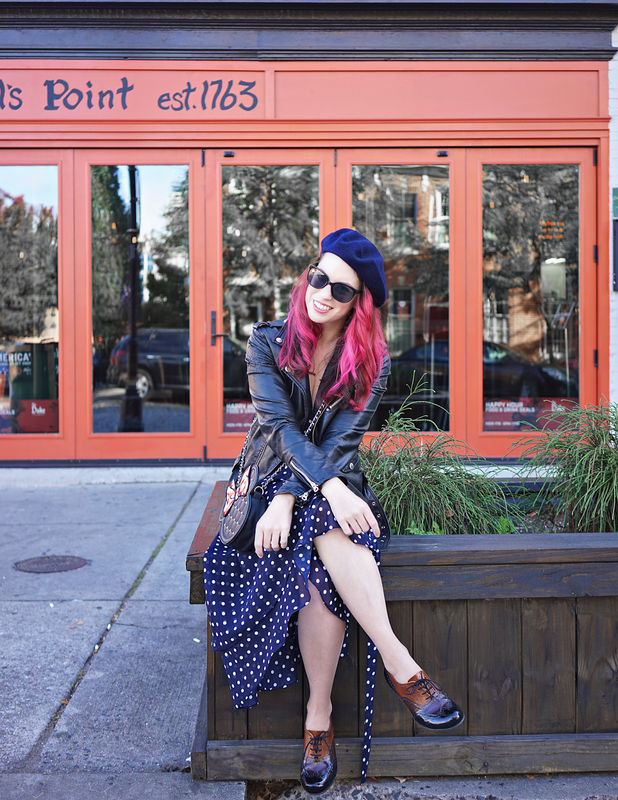 I paired my bag with a Betsey Johnson Chiffon Dot Wrap Dress, a navy beret, my favorite moto jacket (similar) that desperately needs to be replaced and my Fidji Oxfords (they are so comfortable, you can find similar ones here) This dress actually has cute little flutter sleeves, which I love. 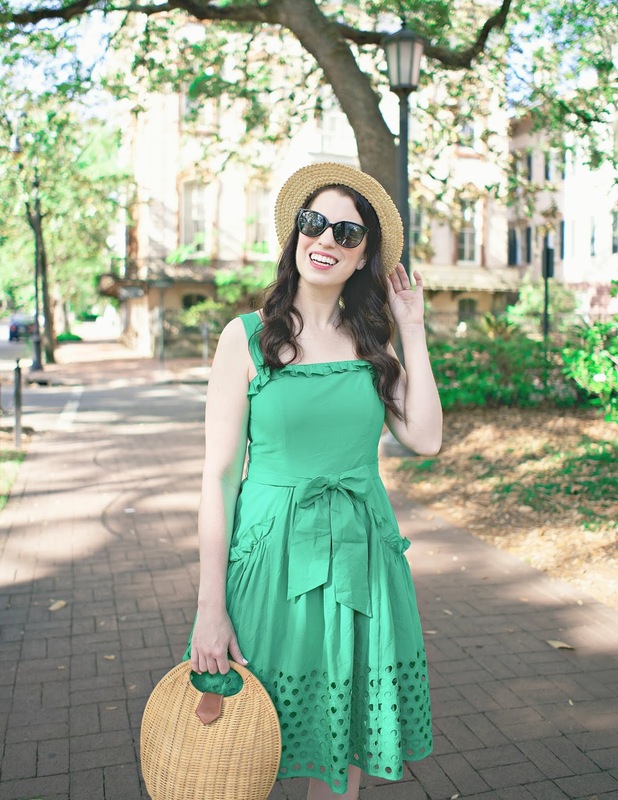 It's so nice to find dress that is not sleeveless or strapless - they seem to be so rare! I also thought the hi-low hem was a great though - the dress looked so pretty when there was a little breeze. Some people have found this dress to run small, but I was able to order in my usual size (6) without it being an issue. However, if you're on the cusp, definitely size up. Be warned though, you will need to add a button to the V neck because it is very low! 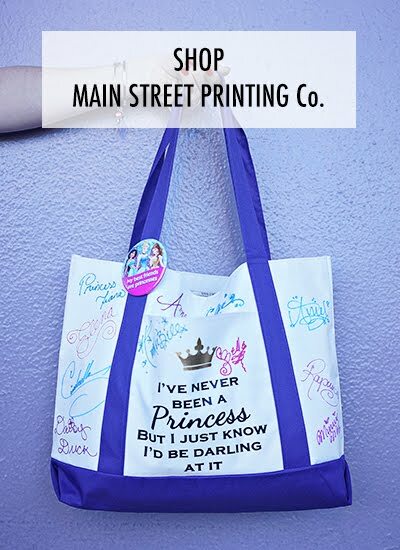 Would you wear a Disney bag in your every day life? 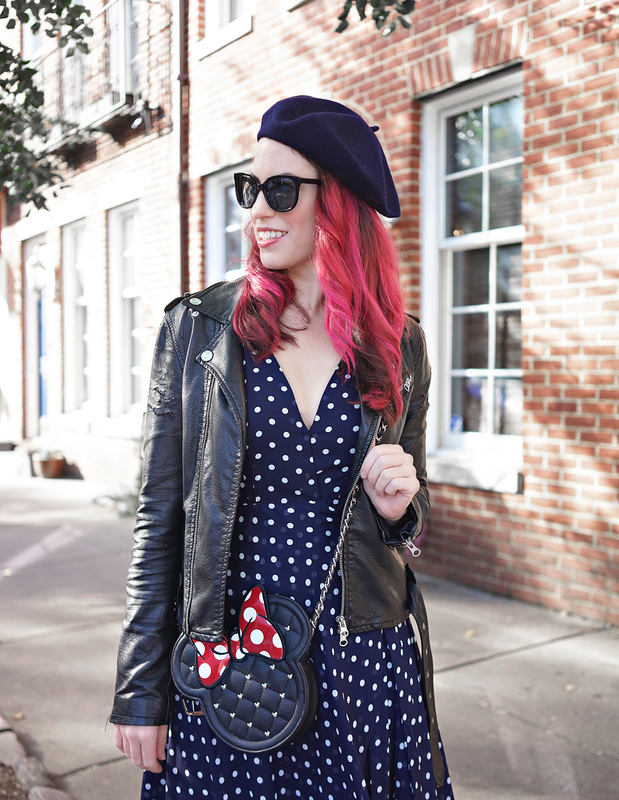 How do you show your Minnie Style?